What I discovered about cat back exhaust systems might surprise you. I was in your same position only a few months ago shopping for a performance exhaust system for my car. Unfortunately, I had to wade through countless forums and product websites to find what I was looking for. Then it became my mission to help other gearheads, just like myself, find the right exhaust system for their car or truck – without the hassle. Here you’ll find in-depth reviews on cat back systems to help you get more power without spending a fortune. As an author and consultant, I love helping my clients solve their problems. Now I want to help you too! What type of cat back exhaust system are you looking for? What is a Cat Back Exhaust System? “Cat back” refers to the section of the exhaust system that runs from the outlet of the catalytic converter to the exhaust tips. 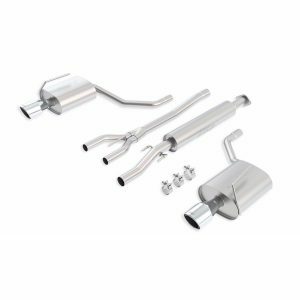 A cat back exhaust system usually includes the pipe from the converter to the muffler, the muffler, and the exhaust tips. Cat-back exhaust systems generally use larger diameter pipe than the stock system. Good systems will have mandrel-bent turns that allow the exhaust gases to exit with as little back pressure as possible. The mufflers included in these kits are often glasspacks, to reduce back pressure. If the system is engineered more for show than functionality, it may be tuned to enhance the lower sounds that are lacking from high-RPM low-displacement engines. What are the Benefits of a Cat Back Exhaust System? Cat back systems are popular among car and truck enthusiasts because they are an easy way to increase power. One of the reasons a new exhaust system can produce more horsepower is due to the careful design of these systems. Usually car and truck manufacturers are focused on maximizing space and minimizing materials when designing a new car. Rarely do they focus on increasing horsepower. As a result, stock exhaust systems are usually inefficient and reduce power. Aftermarket parts companies have made a fortune by creating custom cat back exhaust systems for almost every make and model of vehicle. These systems are more efficient and take advantage of mandrel-bent turns to reduce back pressure. The best part is that they will bolt into place where the original exhaust was without any modifications. A great advantage of a cat back system is that it comes with all the parts to replace your existing exhaust including the exhaust pipes, muffler and exhaust tips. How Much Does a Cat Back Exhaust System Cost? If you’re looking to boost your performance without spending a fortune, a cat back exhaust system is a great place to start. An average exhaust kit will run you around $300 or more. ExhaustSystemsGuide.com is a participant in the Amazon Services LLC Associates Program, an affiliate advertising program designed to provide a means for sites to earn advertising fees by advertising and linking to Amazon.com. Amazon and the Amazon logo are trademarks of Amazon.com, Inc. or its affiliates.